← Thinking of Starting A New Nonprofit? Think Again! Where we want to wind up is in a place where you all have strong, comprehensive and integrated fundraising programs. But you absolutely will not get there if you don’t spend the time planning. Be very clear as to who owns what. Simple enough and yet most nonprofits don’t seem to get there. 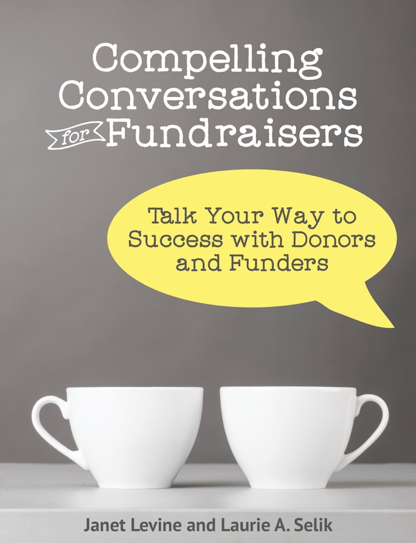 Taking the time to develop your fundraising plan is time well spent. Writing it down is critical. “In your head” is about as realistic as “in your dreams,” and about as effective. Your plan doesn’t have to be elaborate. In fact, simple is probably better. Start with a table or spreadsheet. 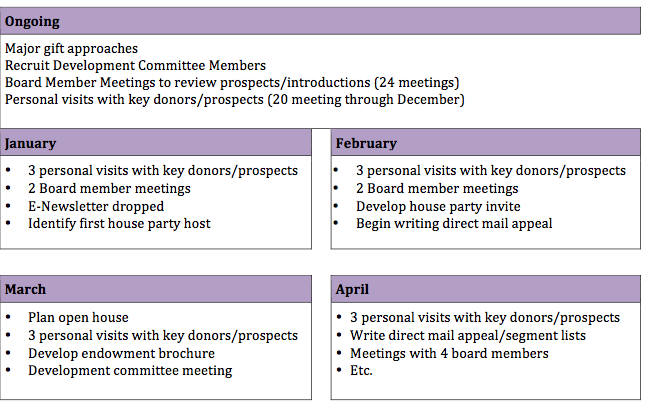 The first column is where you will indicate what type of fundraising you are doing: Annual Giving, Special Events, Major Gifts, Foundation Grants, etc. In the second column, you will focus on the technique. So your annual fund drive may be comprised of direct mail; open houses; house parties; face-to-face solicitations. Your major gifts may also use all but direct mail as techniques to reach out to larger donors. In each month, indicate what steps you will be taking and who is the owner. For example, for a direct mail appeal that is going out in May, January may be the month the letter and reply device get written. Perhaps the development director is the person doing that, or maybe you’ve hired a writer. If this seems too complex, no problem. Simplify. Only have one column for what your are doing. Or mark off the months and in each, indicate what you are doing. Whatever works—and whatever you will work is good. To be blunt, working a mediocre plan will get you much further than random moments of brilliance followed by nothing very much. So stop complaining that you don’t have time. Quit pretending it’s all in your head. Get to work on building a plan. And then work that plan. Janet Levine works with nonprofits, helping them to increase their fundraising capacity. Hire her to help you increase yours–or to help you be a better, more effective fundraiser. Learn more at http://janetlevineconsulting.com. This entry was posted in fundraising, planning and tagged consistency, development, fundraising, Motivating, planning, productivity. Bookmark the permalink. There is–it’s being fixed. In the meantime, you can read the blog at either my LinkedIn page or on my website (http://janetlevineconsulting.com). Sorry for the confusion. The domain got unlinked from the host and I’m working to get that resolved.